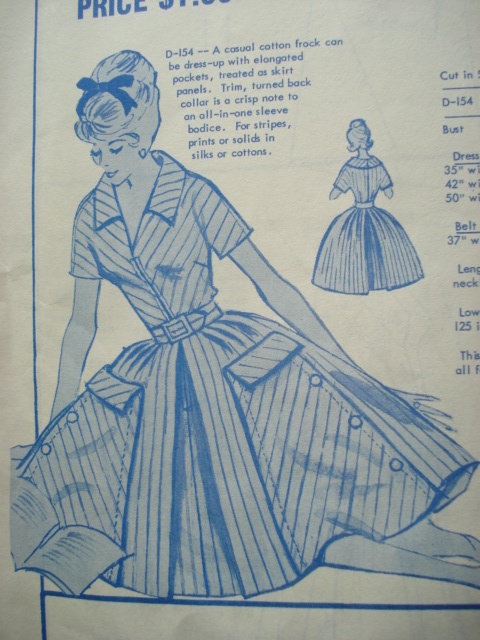 Beth B. sent me this, from SoVintage Patterns. Now, THOSE are pockets, yes? Oh, and thank you all SO much for your wonderful response to last week's charity drive kickoff! We're already nearly halfway to the goal of $1500 for Books Through Bars … and I forgot to mention the end date, which, this year, will be Epiphany. (Seemed appropriate, and if money's tight before the holidays, if gives you a little longer to donate …) A few folks have had trouble with the Network For Good widget interface, so I'm going to ask Books Through Bars if they have alternate avenues … Overseas/UK folks *can* use the widget (which asks for state/zip code) by putting their equivalent geographic locations/postal codes in those fields, btw. Don't forget to put "Dress A Day" in the "Dedication" field so that we can track the donations … to donate TODAY, click here. When you get your receipt, forward it to me, since one lucky donor have a character named after him or her in my forthcoming novel, "The Secret Lives of Dresses"! This reminds me of an early Barbie-doll dress, but in a solid fabric, not stiped. Was it the one where she was a babysitter? Or am I just making that up???? I AM IN LOVE!I bet I could fit my dogs in those pockets..
Ah, I can tell you why her book is so far away.. She is farsighted, but vanity does not permit her to wear glasses so she must keep her book at arm’s length so that she is able to read it… Why, yes I am farsighted. And I wear glasses. Since age two. Before that it would have been pointless, as I was blind. To me, for some reason, those pockets look like doors. That lead to . . . Narnia, or The Unknown, or Honeydukes, or something. The buttons look like doorhandles. ALL GOOD. for some reason, those pockets look like doors. That lead to . . . Narnia, or The Unknown, or Honeydukes, or something. I don’t mean to be vulgar, but the BACK of the dress looks sort of like some doorway, too. What is that “curtain” effect? And congratulations on your book!!! If only it were out now, it would make a great holiday present for a FEW people I know. Can’t wait to read it! Off topic: I just ran across a contest that might be of interest:The Make it With Wool Contest, for which entrants make garments of wool fabric or yarns.Prizes/scholarships of up to $2000, but the contest ends in late January. She’s not reading the book. She’s listening to someone just out of frame (probably a child) read the book to her. I like it! I like to bring magazines with me to …well, just about anywhere I can get away with looking at them. This would be perfect for stowing my mags and a lot less cumbersome than a messenger bag. I also think this would be great for a mom who picks up toys and stuff when cleaning. Fill the pockets and then dump ’em in the toy box. Congratulations on the book, Erin! I’m so excited to read it. I LOVE those buttons, and the stripes, yes, and Nadine, the pockets do look like doors, it is a dress as performance art! It looks to me like she just fell over while trying to reach to the bottom of one of her pockets while holding a book in her other hand. Being the lady that she is her face belies no pain or grimace with the stumble. She smiles demurely, laughing a little at herself, as she gracefully struggles to get back on her feet. No, I like the buttons. Or, at least, I think the buttons could look awesome in the right context. In for a penny, in for a pound, after all.I’ve never heard short-sheeting called an “apple-pie bed” before. Learn something new every day. Something about the stiffness of the skirts flair, as well as its stripiness, puts me in mind of this selvedge dress (which Im pretty sure youve featured here before): http://vintagericrac.blogspot.com/2008/10/big-selvedge-project.html Though youd have to lose the pockets using selvedges. Bulk would be unworkable.Yes, Id be tempted to go with buttons. Maybe these fabric-covered punctuation beauties: http://www.mjtrim.com/Catalog/Product/7/32053/32053.aspx! ? would add a pleasing sense of intrigue, yeah?